For more detailed information on the connector and its wiring, please refer to the official SAE document. J1939/13 defines a standard connector for diagnostic purpose. It does allow access to the vehicle communication links. 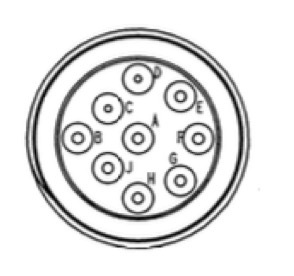 The connector is a Deutsch HD10 - 9 – 1939 (9 pins, round connector). According to the official document, SAE J1939/13 Off-Board Diagnostics Connector, the connector supports both the twisted shielded pair media (as defined in SAE J1939/11) as well as the twisted unshielded quad media (as defined by ISO 11783-2). The designations of the individual signal wires are according to the CAN Standard CAN_H and CAN_L. 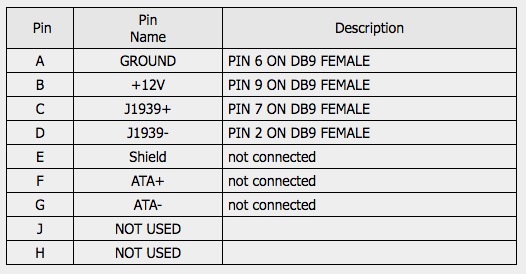 For SAE J1939/11, a third connection for the termination of the shield is denoted by CAN_SHLD. 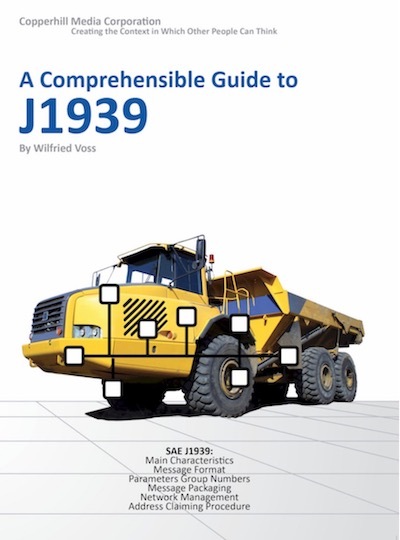 SAE J1939 has become the accepted industry standard and the vehicle network technology of choice for off-highway machines in applications such as construction, material handling, and forestry machines. J1939 is a higher-layer protocol based on Controller Area Network (CAN). It provides serial data communications between microprocessor systems (also called Electronic Control Units - ECU) in any kind of heavy duty vehicles. The messages exchanged between these units can be data such as vehicle road speed, torque control message from the transmission to the engine, oil temperature, and many more. Click the button below to add the SAE J1939 M/F Pass Through to DB9 Female Cable to your wish list.